Thousands of Italian desserts feature nuts, which grow in every region of the country. 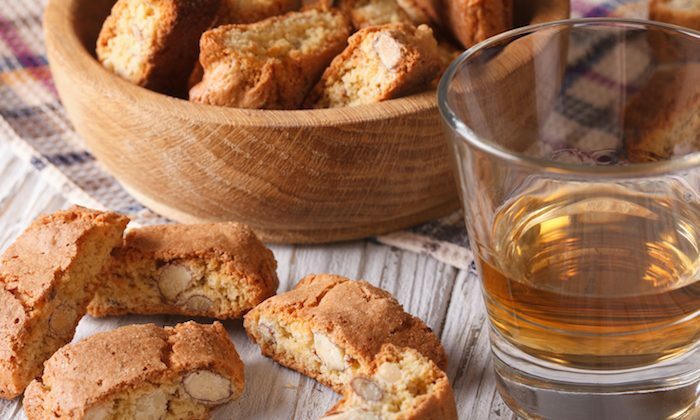 There are nut-flavored granitas, gelatos, and semifreddos, as well as countless classic nut-cakes, like the famed pine nut-coated torta della nonna, or “Grandmother’s cake,” and spongata, a honey-rich specialty of Emilia-Romagna filled with almonds and walnuts, whose recipe was first written down in the 14th century. Many Italian nuts are so unique to the area where they grow that they have been granted special government protection. Chestnuts have been a staple in Italian cuisine for centuries, cultivated throughout the country by the Middle Ages. Dried, they are ground into flours for treats like Tuscany’s castagnaccio, a dense cake topped with pine nuts. Pureed, they make a traditional filling for sweets like calzonetti, a fried ravioli specialty of Abruzzo. Twelve different types of chestnuts, from regions including Veneto, Piedmont, Tuscany, Lazio, and Campania, have DOP (Protected Designation of Origin) or IGP (Protected Geographical Indication) status. The pistachios of the Sicilian town of Bronte, at the foothills of Mount Etna, are so special that they too have been granted this government protection. Smaller, more deeply green, and with a more richly concentrated flavor than California pistachios, Bronte pistachios are the hallmark of cannoli and cassata, traditional Sicilian sweets. Italy is the world’s second-leading producer of hazelnuts, and those from Piedmont, Campania, and Lazio have also been given special government protection status. Hazelnuts play a starring role in Nutella, Baci, Ferrero Rocher, and dozens of other world-renowned Italian chocolate creations. 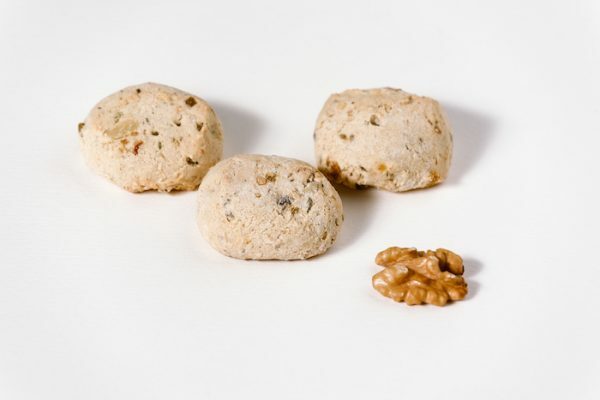 Nuts are especially prominent in Italian cookies, with many having recipes that date back centuries. Here’s a sampling. 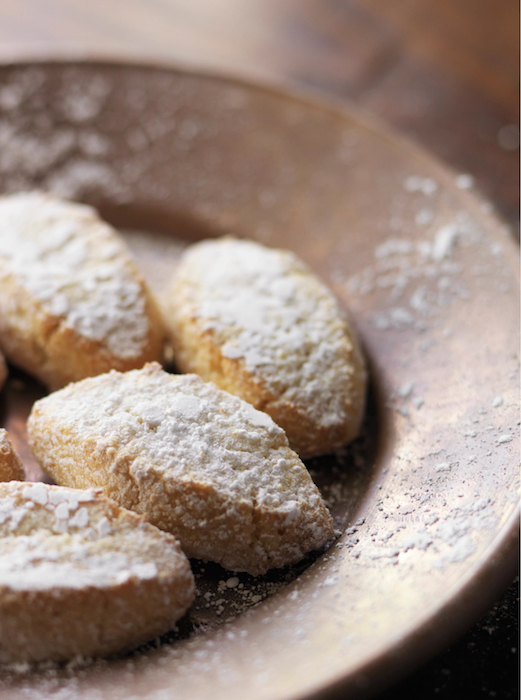 Amaretti, which means “little bitters,” are a specialty of northern Italy, made of sugar, almonds, and egg whites. Their invention is attributed to Francesco Moriondo, pastry chef at the court of Savoy in the mid-17th century. Amaretti can be either hard or soft and can vary in size, too. 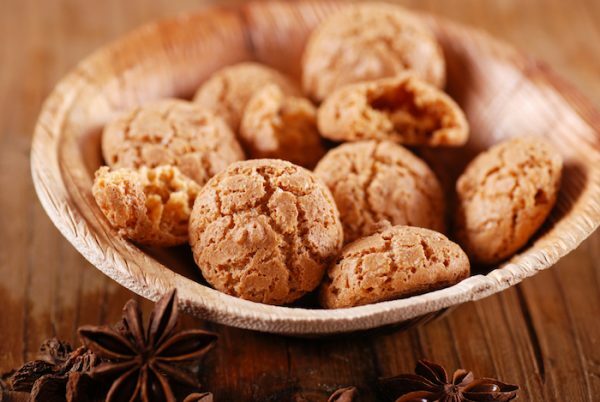 The soft ones are eaten as cookies, but interestingly, hard amaretti are called for as an ingredient in many traditional Italian recipes, from savory dishes to desserts. In desserts, they are often a base for custard, semifreddo, and cake decorations. In savory dishes, they are famously the filling for pumpkin ravioli and tortellini. 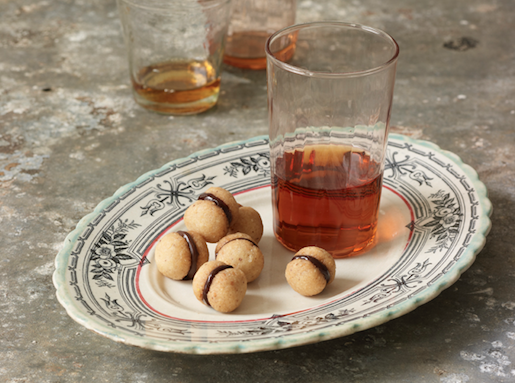 “Lady’s kisses” are two tiny, round hazelnut shortbread cookies sandwiched together with a dark chocolate filling. The name refers to the fact that the cookies resemble a lady’s mouth as she’s about to bestow a kiss. The exact origins of this adorable cookie are unclear, with some legends crediting the cookie’s invention in the 1800s to the Piedmont town of Tortona, and others linking it to a chef working for the royal Savoy family, who created them as a new dessert for King Vittorio Emanuel II. 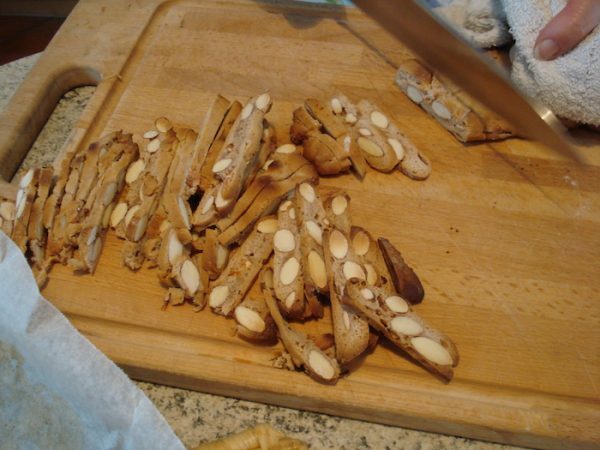 Cantucci are crunchy almond cookies created in the Tuscan town of Prato during the Renaissance. Many non-Italians mistakenly refer to cantucci as “biscotti.” Biscotti is actually the Italian word for any sort of cookie, and comes from the Latin word for “twice baked.” In ancient Roman times, twice baked biscuits were given to Roman soldiers to sustain them during long battles. “Little horses” are soft cookies made with honey, nuts, and anise. They are a typical Tuscan sweet created in Siena in the Middle Ages. The name probably comes from the fact that they were offered to stopping travelers at the stables of area inns. “Dead man’s beans” are bean-shaped cookies made with almonds, pine nuts, and egg whites. They originate in the Umbria and Lombardy regions of Italy during ancient Roman times, and are traditionally eaten on All Souls’ Day, when Italians visit cemeteries to remember deceased loved ones. Honey-sweet, with a pleasing peppery bite, these thin, crunchy biscotti date back to the Renaissance. Unlike most cookies, they’re made without butter or eggs. The absurdly simple list of ingredients—basically just honey, almonds, pepper, and flour—produces a very sophisticated cookie, especially wonderful when made with strongly-flavored darker honey like chestnut or buckwheat. Pepatelli are a classic rustic dessert from the Teramo section of Abruzzo. Surprisingly, since it’s fairly far south, it’s also known as one of the coldest regions of Italy. Pepatelli are typically served in the winter, especially for the holidays, enjoyed with a glass of vincotto, the local Abruzzo dessert wine. Originating in Siena in the Middle Ages, ricciarelli, meaning “curly,” are soft, oval-shaped cookies. They are made with ground almonds, honey, and egg whites, and topped with confectioners’ sugar. Literally meaning “crumbly,” sbrisolona is rustic and grainy, with a homey taste. 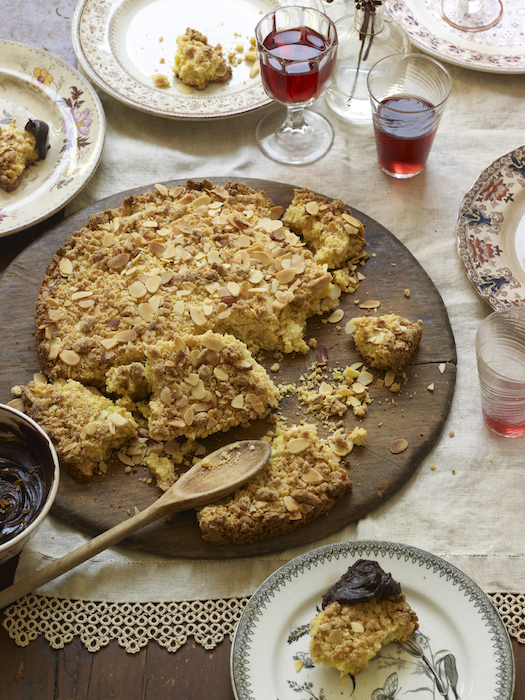 It is essentially a giant cookie, perfect for communal sharing, traditionally set out on the middle of the table and broken with the hands or a wooden spoon, with everyone nibbling bits and pieces. A typical dessert of Lombardy, it’s so tightly tied to that region and Italian culinary heritage that Italy has applied for protected geographical status.